Solar and Wind are the investors' favorite renewable energy types. The United Nations UNEP publish an insightful yearly publication on investments in renewable energy. This is interesting because this cuts through the nice talk and zooms in on where the money flows. 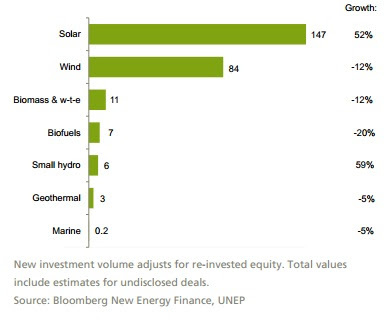 Global investments in 2011 in billion USD in different types of renewable energy. Right hand figures show 2011 growth on 2010. It is interesting to see that Solar and Wind run with the majority of the investments. 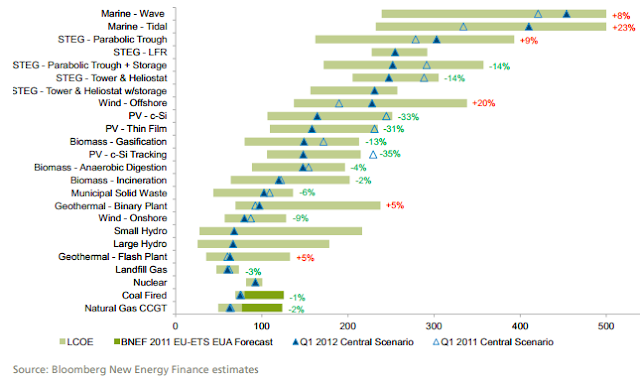 Of total investments in 2011 of 257 BUSD, solar and wind represent 90%. Solar has seen an extraordinary growth in 2011, contrary to all other types of renewable energy except small hydro. The investments are a result of national energy policies and subsidies as well as developments in technology and costs. Global investments in billion USD in 2011 by region. 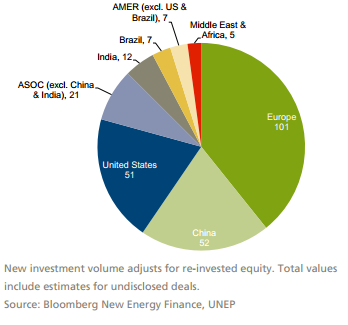 Europe emerges as the region with the largest investments in RE, whereas China is the country with the largest investment. China invests mainly in wind, whereas in Europe solar PV especially in Germany and Italy is the favorite technology. Compared to my previous post this report has much more up to date data. It is interesting to note that solar PV is currently getting more competitive as we speak with more than 30% reduction in cost in only one year. This is quite extraordinary, and is due to the overcapacity and shake out that is currently happening in the solar industry.We can see that several RE technologies (wind, hydro and landfill gas) are now competitive towards conventional energy, which is also the reason why these are prefered by China and other developing countries that cannot afford the luxury of choosing RE over conventional just because it is "cleaner". This is encouraging reading that confirms that RE is competitive in many cases and costs continue to fall in many cases. Actually RE investments are only trailing slightly behind investments in conventional energy. There are other problems associated with renewable energy such as the fact that the most popular solar and wind are variable in nature and are therefore challenging to manage. This is an issue we will have to look at in a later post. What is the Cost of Renewable Energy?